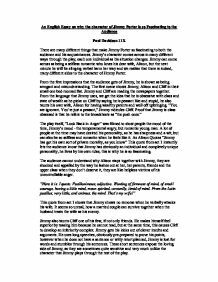 An English Essay on why the character of Jimmy Porter is so Fascinating to the Audience Paul Davidson 11X There are many different things that make Jimmy Porter so fascinating to both the audience and his acquaintances. Jimmy's character comes across in many different ways through the play, each one individual as his situation changes. Jimmy can come across as being a selfless romantic who loves his dear wife, Alison, but the next minute he will be slinging verbal harm her way and we realise that there is indeed, many different sides to the character of Jimmy Porter. From the first impressions that the audience gets of Jimmy, he is shown as being arrogant and misunderstanding. The first scene shows Jimmy, Alison and Cliff in their small one bed-roomed flat. Jimmy and Cliff are reading the newspapers together. From the language that Jimmy uses, we get the idea that he is obsessive with class and state of wealth as he picks on Cliff by saying he is peasant like and stupid, he also taunts his own wife, Alison for having wealthy parents and well off upbringing. "You are ignorant. You're just a peasant," Jimmy ridicules Cliff. ...read more. 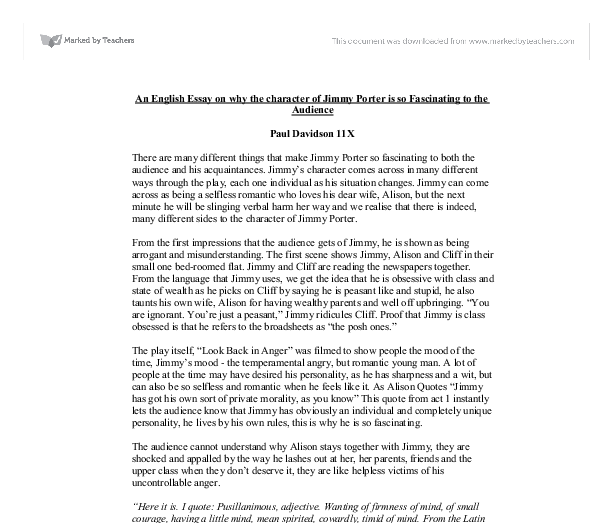 These short sentences expose the loving side of Jimmy, as they are sometimes quite sensitive and very much unlike the character that Jimmy plays through the rest of the play. Alison and Cliff become tired of Jimmy's arguments, so they give up on taking up their side of the argument at hand and humour him, letting him win his arguments, just to make him feel better of himself, so he has the last say also making himself feel much more superior to his flatmates. "What are you, welsh trash?" Jimmy provokes Cliff. "Nothing, that's what I am," Cliff does not even try to defend himself, this is because he knows that Jimmy would never let him win. Jimmy's past is captivating to the play's audience. The way he describes himself as being the only one who cared when his father was dying is really quite touching and suggests a reason as to why Jimmy acts like he does. "I knew more about love... betrayal... and death, when I was ten years old than you will probably ever know all your life." When Jimmy takes Alison into his arms and apologises to her, he shows a true loving personality that maybe he could have sustained all the time if this event had not ...read more. This not only shows that Jimmy has an amazing mind but can also make connections between issues that are not obviously related. For example, Jimmy mocks Alison's father "Poor old Daddy - just one of those sturdy old plants left over from the Edwardian Wilderness that can't understand why the sun isn't shining anymore." Interpreted, this shows Jimmy's view of Alison's father as an old plant that cannot understand change. There are some traits of Jimmy's that I admire. For one, he is not afraid to speak his mind, which makes him a truly honest and trustworthy character. He is always on top of the situation and has a very strong sense of mind; sticking passionately to what he has set out to do and not letting anybody get in his way. We know that Jimmy is loving and caring on the inside, he has a wife and cared for his father when he was dying, however it seems that he has trouble trying to show this on his exterior. This loving side of his character is exposed rarely through the play, either when he talks about his father or in conversation with Alison and Helena. ...read more. This is a direct way of communicating the differences between the two women. Helena's voice is another contrast to Alison because her tone is much more controlled and strong also showing her confidence. Through this period of collapse, Spielberg creates lots of tension, as the audience, who have gradually started to become attached to this realistic character, are willing him to snap out of it and gain his composure. They want him to get out of this situation and lead his troops up the beach.